Now that I’ve had a full summer season to use the new Troy-Bilt FLEX Yard Care System in my backyard I thought it would be a good time to provide an update to my previous FLEX review and to share a video with you. I still love the FLEX Mower and have not encountered a single problem while using it this summer. It has continued running and cutting just as well as it did when I began using it back in April. There are so many unique and innovative features to the Troy-Bilt FLEX that it wasn’t possible to cover them all in the video! It’s a very well built and functional machine and I’m completely sold on the concept of maintaining a single engine to power an assortment of accessories. It’s a huge space saver, and eliminates the frustrations of dealing with a rough starting engine that’s been sitting idle between seasons. 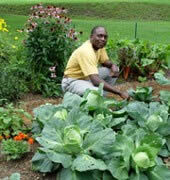 It can also help save money on your equipment purchases in the long run. The FLEX Wide-Area Mower has also saved me a lot of time this summer because I can mow my lawn in less time than it used to require. It is very maneuverable and as shown in the video, I like to set the mower so that the front wheels turn freely, but the wheels can be locked in place if you prefer for more straight line mowing and less frequent turns. I plan to purchase the bagger accessory in time to see how that will work for collecting leaves this fall, I’ll update you on how well that works as well as sharing my opinions on the FLEX Snow Thrower this winter. I’m also curious to watch and see which new attachments Troy-Bilt adds to the line-up. A Chipper-Shredder is one in particular that I think would come in handy in my back yard. 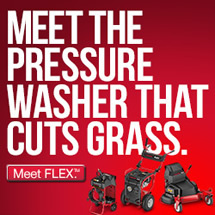 For more information on the FLEX Yard Care System visit Troy-Bilt’s website or stop by a Lowe’s store to see it in person. 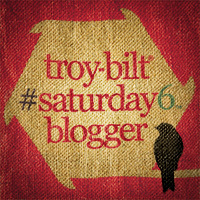 Disclosure: The Saturday6 Blogger Program is sponsored by Troy-Bilt and compensation is provided. In addition, the equipment used for this review and video was provided to me free of charge in return for sharing my honest opinions.